Submitted photos Sharon Manley of Beavercreek remembers her late son, Ryan Manley, in the butterfly gardens at James Ranch Park. XENIA — Life within the display gardens, the butterflies and visiting birds at Greene County Parks & Trails’ James Ranch Park bring comfort and peace to Sharon Manley of Beavercreek. Her son, Ryan, 26, spent his last day alive three years ago helping her garden in the butterfly garden that she and good friend, Susie Lentz, maintain as volunteers. Ryan excelled in academics and athletics as a stand-out pitcher. Following shoulder surgery from an athletic injury and prescription for painkillers, he began an eight-year gritty journey that ended in his death from the disease of addiction on June 2, 2015. Today, a bench placed by GCP&T rests among the blooms, butterflies and garden breeze as a memorial to his life and as a touchstone for Manley to reflect on her son’s life. Three coreopsis that were planted that day by Ryan are replanted each year by Manley and Lentz in his memory. Manley remembers coming back to the garden soon after Ryan’s death and seeing a dove rest on the butterfly water puddler for more than one hour. 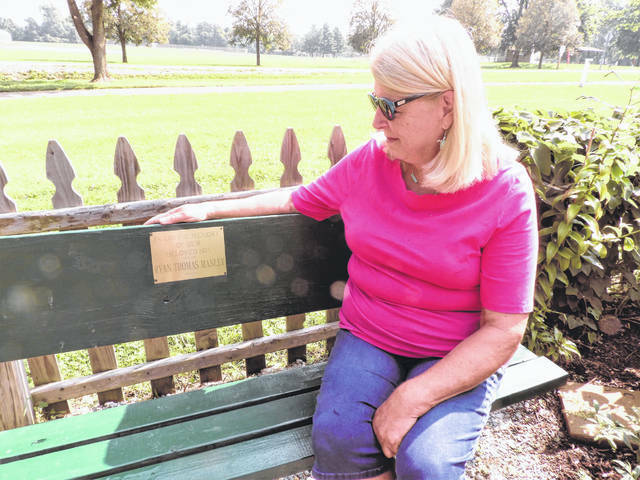 https://www.fairborndailyherald.com/wp-content/uploads/sites/50/2018/09/web1_Manley.jpgSubmitted photos Sharon Manley of Beavercreek remembers her late son, Ryan Manley, in the butterfly gardens at James Ranch Park.